Hope you've all got a crafty Saturday lined up. I stamped random sunflowers off the page in the lower left hand corner of the card blank, using Versafine black onyx ink. I also added some circles. The sentiment by Julie Hickey was also stamped in versafine ink. 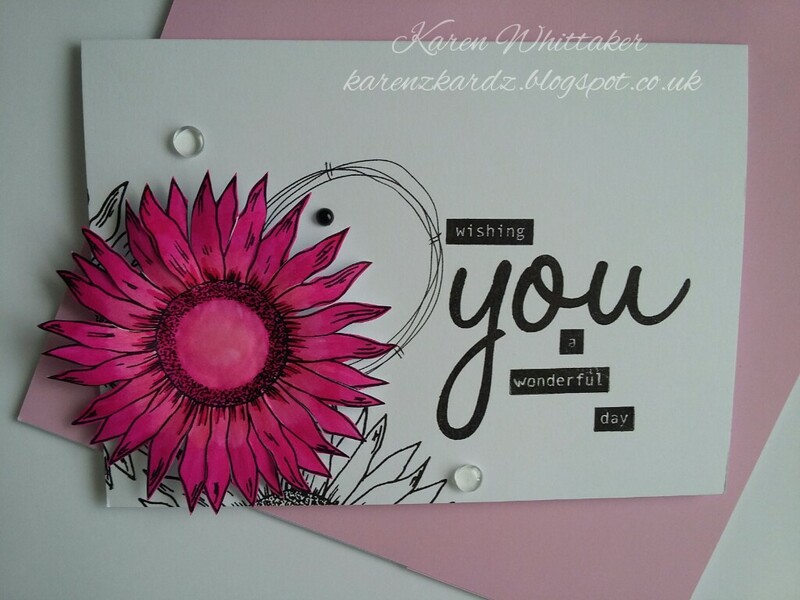 The sunflower was stamped onto a separate piece of card, coloured in with Kuretake clean colour pens and cut out. I moulded it into shape before adhering to front of card blank with foam pads. A few gems were added to compete the card. Thankyou for stopping by and please leave a comment as I read every one. This is fabulous Karen! I love the gorgeous colour. I really like the color you chose for the flower - great design! hi Karen - sorry I've missed commenting on so many of your gorgeous cards, I've just spent a lovely few minutes scrolling through your recent uploads and as always enjoyed the time here! This one in particular is especially beautiful - that flower is wonderful!